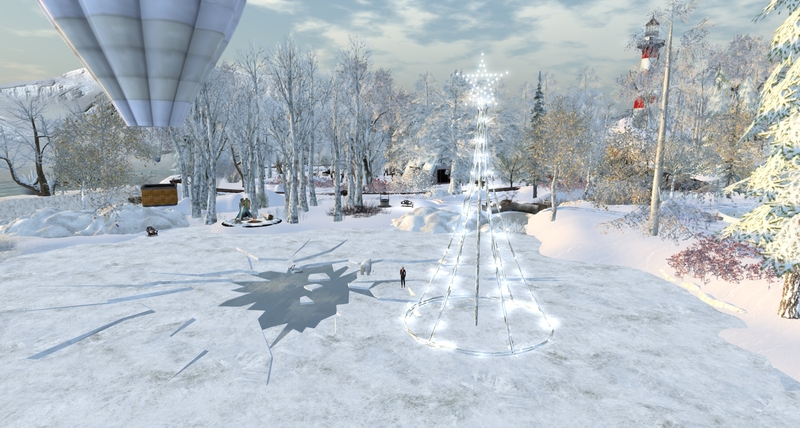 Last Sunday, November 27th, I went simploring and picked a recommendation of Inara Pey’s blog again “Wintertime at The Mill in Second Life“. Her description of “The Mill” is perfect as always, hence I have not that much to add again. For me it was not my first visit to The Mill. I visited the first time in spring 2016 (see here in this blog) also following a post of Inara. Now the winter has come to The Mill and changed it quite a lot. First of all upon my arrival I got a “friendship”-bear offered. What a cute plush toy! I did recognize some key elements and had a deja vue seeing the pier and the sailing ship, or the mill itself of course. But there’re now acitivies like sledding or ice skating and a zip line starting at the lighthouse. And you see some of winter animals like ice bears and penguins. As I did in spring I spent a relaxing hour in this lovely sim and enjoyed myself, used the sledding and the zip line and took quite a lot nice pictures. Many thanks again to Maxie Daviau and Shakespeare (Skinnynilla) for providing your sim for a visit – and for the friendship bear of course!